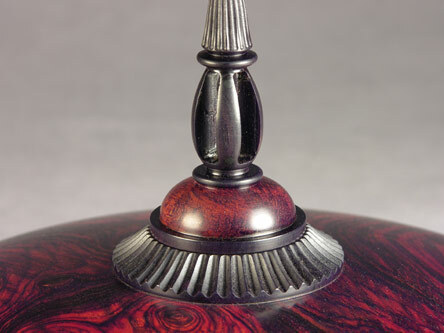 This series of work consists of thin wall hollow turnings with an ornamented lid. The body of each piece is plain turned with the goal of achieving a somewhat uniform wall thickness in the range of 1/8-1/4". This is technically challenging work that cannot be controlled by machine, so it requires careful freehand control of the hollowing tool to achieve the thin wall design of the body without breaking through the delicate wall. The inside is sanded smooth and finished as well. The lids are a variety of ornamental designs intended to complement the shape, color and figure of the body of the piece. In some pieces, the body is highly figured burl wood, or else it is chosen for its color or figure if it is not burl wood. The thumbnail index is arranged in succession from right to left, beginning at top right, and the captions are uniquely numbered for each piece. Click a thumbnail image below to view a larger image. There is a contact form to follow up on price and availability of any pieces of interest.